The 28-year-old had been in training for the early mornings - having done a pilot show on Friday and getting up at 5.30am on Saturday and Sunday to make sure he did not miss his wake-up call. He is expected to double the amount of music played on the landmark show and will present the programme on his own after station boss Ben Cooper said he wanted to move on from the "zoo" format of Moyles's show in which his production team played a large part. Grimshaw, known for his posse of celebrity pals including Lily Allen, Alexa Chung, Miquita Oliver and Harry Styles from One Direction, was a surprise choice to many, with drive-time show host Greg James expected to be the next breakfast host. 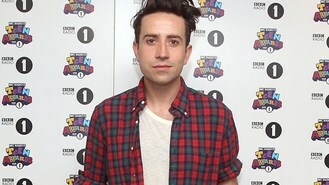 The presenter, known to fans as "Grimmy", was raised in Royton, Oldham, and took his first steps as a broadcaster in student radio while at Liverpool University. He worked at MTV and Channel 4 before co-hosting the BBC2 music show Sound with DJ Annie Mac, and his swift rise continued when he picked up a slot on Radio 1. The last figures available showed an audience of 7.1 million tuning into the Moyles show, well below rival Chris Evans on Radio 2. Bosses will be hoping Grimshaw, 10 years younger than Moyles, who left earlier this month after more than eight years at the helm, can bring in listeners from its target 15-to-29 audience.